Kota Heart Institute is prestigious land Mark on Main Jhalawar Road and is most centrally located at 10-A, Talwandi, Kota. Being a pioneer in cardiac care center functioning under the leadership of Dr. Rakesh Jindal an eminent Cardiologist specializing in invasive cardiac surgeries. Looking at the present trend in Hospital Care it has updated itself to become multispecialty hospital in Kota. It is housed in a modern building specifically designed for hospital care and has all the major departments looked after by respective Eminent Specialists handling Out-Door and Indoor services of the hospital besides managing Critical Emergency care round the clock. It has state of Art Intensive Care Wards managed by Eminent Doctors and Specially trained Para-Medical Staff to maintain alertness in observing and providing prompt medical care to the critical patients admitted under their care. 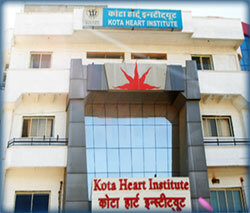 Kota Heart Institute believes in providing fast recovery to its patients by selection of Best Medical Treatments and Personalized care and attention with which it has built strong Trust among the population in and around Kota. At Kota Heart Institute when patients come they start feeling their disease can be cured and our Specialists and paramedical staff strive hard with full dedication that patients leave the hospital fully satisfied and act our messengers in speaking about quality of our service rendered to them. High level Aseptic conditions are maintained though out the hospital complex round the clock under supervision of a professional specializing in Hospital Administration services. The hospital has its own Ambulance Vans equipped with Life Saving Equipment and skilled attendants to administer support while the patient is proceeding to Kota Heart Institute to avail its professional services. It has established Resuscitation, Trauma Management services besides undertaking Poisoning cases in a bid to save lives by helping people in their struggle for life providing life support systems and round the clock observation. Kota Heart Institute understands its patients and have kept the charges most reasonable for the unmatched Professionally Managed Health Care Services. Experienced Cardiac surgery team performing all Cardiac surgeries (coronary Artery Bypass Grafting , Valve Replacement, Congenital Heart Disease, Repair of Vascular Injuries, Lungs and pleural space surgery , management of Chest Injuries. Paediatric and Neonatal Intensive Care Units. Indoor Patients Canteen – We have Separate Canteen Fully Monitored by Dietician.